Andreea Calude on Let’s get things done! Tana Wu on Let’s get things done! As a parent of young children, I feel the weight of responsibility on my shoulders in regulating how our children speak – particularly when we are in public, but also during family get-togethers. Are they sufficiently polite? Do they remember to say “please” and “thank you”? Do they say “sorry”? The rules for such behaviours are assumed to be uniform, squeezed under the umbrella of “being polite” (which seems to correlate with being well-educated or from a “good” family) or under “cei șapte ani de-acasă” (in Romanian, literally “the seven years from home” – Romanian children start school at 6 or 7 years of age). But in reality, the “rules” vary drastically across language and culture. 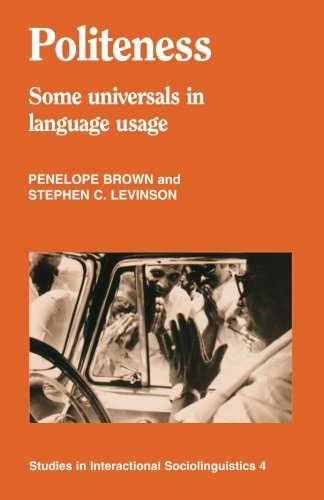 Linguists Penelope Brown and Stephen Levinson summarised how different cultures approach “the rules” in their 1987 book “Politeness: Some Universals in Language Usage” – in what has since become the most influencial theory of politeness. 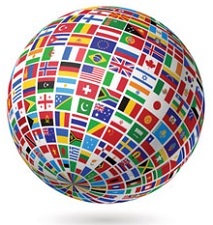 Brown and Levinson argue that all languages and cultures tend to politeness norms of one sort or another, in a bid to maintain a peaceful society and good relationships with others. In other words, this is a (cultural) universal. But while humans universally value stability, there are times when our needs impinge on those of others and threaten the smooth fabric of our relationships. Such needs can range from minor inconveniences, like wanting someone to open a door for you, to bigger impositions, like asking your boss for a long time off work to travel around the world. This is where politeness comes into play. Languages provide various types of resources, for example, politeness words (“please”, “thank you”, “sorry”), grammatical structures (verb endings to encode respectful forms of address), and pronoun forms (polite forms, colloquial forms, honorifics) to help mitigate the bind that speakers find themselves in when negotiating sensitive situations. So how do speakers decide which resources to use and when? In a given situation, can you just say “sorry” or do you need to go to the more elaborate “I am so incredibly sorry for this major inconvenience”? Or is it safe to simply be direct (what Brown and Levinson term “bald on record”)? According to Brown and Levinson, the process can be summarised by an equation (yes, an internal maths calculator comes out just about every time we speak) with three main variables: (1) COST OF IMPOSITION (how much of a pain am I being? ), (2) DISTANCE (how close am I to this person, will I see them again or not, do I care about them or not? ), and (3) POWER RELATION (how much power does this person have over me; are they my boss or an elder, or just a mate?). Sound complex? Maybe a bit. But wait, there is more! In an article published this March in “Language Sciences”, linguist Sooho Song tested statistically this equation (and from what I can tell, for the first time in the history of politeness research) by conducting experiments with speakers from three different cultures assumed to vary with respect to politeness norms: American, East Asian, and Latin American. Without going into the details of her interesting experiment, she illuminates some fascinating results. As progress often goes, Brown and Levinson’s equation needs adapting, to account for cultural differences. Song’s new equation keeps the initial three terms, but now each term receives a coefficient which is specific to the language and culture at hand. In addition, there are two new terms: an intercept (which is just a constant) and an error term (which I interpret as being correlated with individual variation, or accounting for additional variation not taken care of already). Song found that in all three cultures, power relations and distance between speakers matter much more than cost of imposition. So you can safely ask for big favours without softening the blow, as long as the person you are asking is close to you and holds little power over you. With the exception of America: the cost of imposition mattered (significantly) only for Americans, but not for either Latino or East Asian participants. Secondly, the power factor (how much power does this person have over me?) rated universally as most important, but – and here are some marked differences – it varied in relative importance across the three cultures. Power was immensely important for East Asian cultures, important but not extremely so in magnitude for Latino speakers, and still important but relatively more balanced against the distance factor for Americans. OK so you might think, cultures vary with respect to their preoccupation with politeness – is that such a big deal? Did we not suspect this all along? Well, yes maybe, but to be able to capture this with a mathematical equation, and to see empirical differences between cultures with respect to such a slippery concept as politeness is to my mind rather beautiful! Add to this that even single languages exhibit all sorts of variation, it is all the more astounding that Song’s calculations add up to previously suspected norms at all. As reported recently in New Scientist, drastic differences can be spotted even within one single language. Comparing rates of self-reported apologies between Americans and Brits, it appears that Brits apologize significantly more often than Americans, and interestingly, they themselves perceive this amount of apologizing to be slightly excessive. Excessive though it might be, it need not necessarily be a bad thing. Apologies are not just about expressing regret and admitting fault, but also about achieving a feeling of power and a sense of increased commitment to one’s values. America and England are two countries not only separated by the same language, but also by the same politeness norms – George Bernard Shaw and Oscar Wilde might have been amused to learn. All the more power to Song’s equation for detecting statistical differences across languages and cultures. But where does that leave my own family and children – born in New Zealand (a country which prides itself in being less formal, more relaxed and very much down-to-earth), to a Romanian-born mother and a British-born father? My only hope is that our kids turn out to be good at maths so they can negotiate their individual whanau as called for by each situation. Brown, Penelope & Levinson, Stephen D. 1987. Politeness: Some Universals in Language Usage. Cambridge: Cambridge University Press. Sarner, Moya. 14 June 2017. The easiest word. New Scientist 38-41. Song, Sohoo. 2017. The Brown and Levinson theory revisited: A statistical Analysis. Language Sciences 62: 66-75. A blog about language, words, grammar and linguistics ideas by Andreea S. Calude.